Eight different double-stranded RNA (dsRNA) molecules were found in the wild-type fungal strain Botrytis cinerea CCg427. The electrophoretic profile displayed molecules with approximate sizes of 1, 1.3, 1.6, 1.8, 3.3, 4.1, 6.5, and 12 kbp. Sequences analysis of the molecules in the 6.5-kbp band revealed the presence of two different dsRNA molecules (dsRNA-1 and dsRNA-2) of 6192 and 5567 bp. Each molecule contained a unique ORF (5487 and 4836 nucleotides in dsRNA-1 and dsRNA-2, respectively). The ORF of dsRNA-1 encodes a 205-kDa polypeptide that shares 58% amino acid sequence identity with the RNA-dependent RNA polymerase (RdRp) encoded by dsRNA-1 of Alternaria sp. SCFS-3 botybirnavirus (ABRV1), whereas the ORF of dsRNA-2 encodes a 180-kDa polypeptide that shares 52% amino acid sequence identity with an unclassified protein encoded by dsRNA-2 of ABRV1. 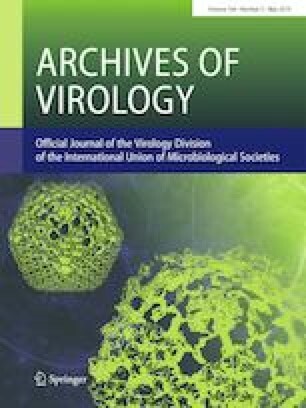 Genome organization and phylogenetic analysis based on the amino acid sequences of RdRps in members of different dsRNA virus families showed that the dsRNAs in the 6.5-kbp band correspond to the genome of a new botybirnavirus that we have named “Botrytis cinerea botybirnavirus 1”. This work was supported by FONDECYT postdoctoral Project no. 3160278. This work was financially supported by the National Commission for Scientific and Technological Research (CONICYT) through the postdoctoral Project no. 3160278. In this study, the authors did not perform any experiments using human participants or animals.